Please note that the colors on the screen may not be 100 percent accurate, depending on your computer and printer settings. To see actual cloth colors, please ask to see actual cloth samples. You can also click onn the above images to open a new window and view these choices on a larger scale. As a general rule, cloth is not part of the table and is added by the table dealer – not the table manufacturer. Cloth is normally produced in weights from 14 to 22 ounces. The heavier cloth will generally last the longest. Backed cloth is usually used on coin-operated tables. It plays poorly, but is less likely to be damaged by a miss-cue. Unbacked cloth will usually be used in homes, pool halls, tournaments, and other places where the quality of play is important. The Billiard Congress of America recommends a wool/nylon blend felt for 8-Ball and 9-Ball, and worsted cloth for Snooker and Billiards. Worsted cloths use long wool fibers that are twisted into very thin threads, while felt uses short wool and nylon blended fibers that create more of a “fuzzy” nap. Higher wool contents (90% and above) last longer, but they expand and contract with humidity changes. They should be kept in a room with good humidity control. Best would be with a humidifier and a dehumidifier. Lower wool contents (70% – 80%) are less likely to bow or wrinkle on some days. Many European tournament tables actually have heaters built into the slate to keep their high-wool cloth dry. Worsted cloths will give you faster play on dry days, but slower play on humid days. Not having a nap, they do not require much brushing. They are generally faster and more accurate, though difficult to play on; as the ball will slide for a longer time before “English” takes over when the ball starts rolling. For this reason, professional players generally prefer the worsted cloth. They are more used to dealing with many cloth types, and difficult cloth gives them an advantage over less experienced players. That doesn’t mean that professional tournaments are generally played on worsted cloth, however. They are generally played on whatever cloth is already on the table, unless a cloth manufacturer has paid to switch the cloth as part of a sponsorship. Normal felt (which comes in many different qualities) requires regular brushing to maintain a consistent direction of the nap – particularly during the first month or two of use. It is the most widely used cloth on American pool tables. It is a bit slower and can be a bit less accurate, but it gives the average player better ball control. “Players Cloth” is a pre-broken-in version of regular felt that is shaved slightly to make the fibers shorter. It requires less of a “break-in” period and it’s great for setting up a tournament table that will be played right away. There are several coatings available on billiard felt now. They are generally designed to reduce damage from spilled drinks, etc. Just remember that “reduced” does not mean “prevent”. That means beer and wine. 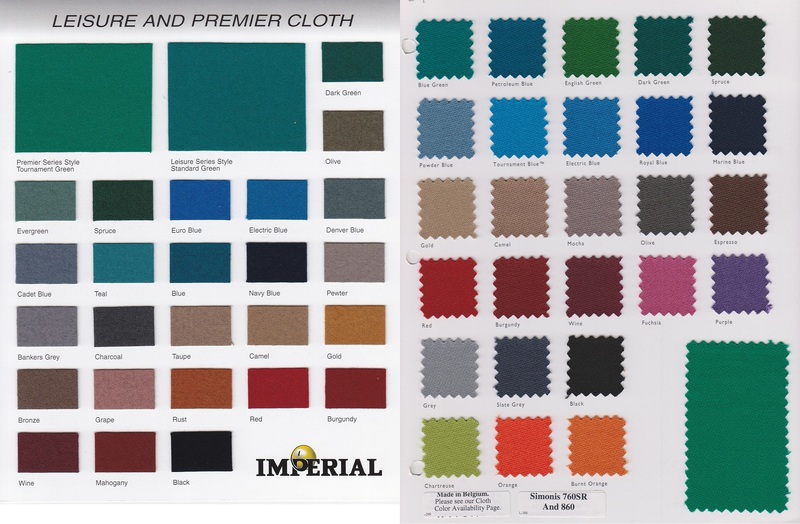 Premier Cloth is a 22 ounce non-directional 75% wool/25% nylon blended felt. It is our highest-quality regular cloth, and meets or exceeds all BCA regulations for tournament play. It will last a long time, but it does require a break-in period and regular brushing. It is an upgrade from what the better dealers would typically include with their new tables, and it is the easiest cloth for average players to control the ball. Made by Novalon, it is bathed in a stain-resistant solution. Olhausen Accuguard by Hainsworth is a coated, worsted wool 24 ounce cloth recommended by Olhausen. It is a very high-performance cloth with excellent stain-resistance, long life, easy care, and good resistance to humidity changes. Stock colors only. Simonis #760SR European 100% worsted wool 22 ounce cloth will last longer and require very little care, with a stain-resistant technology added during the manufacturing process. However, players rated below A or even Open level may find it difficult to control their English. Simonis #860 European 100% worsted wool 22 ounce cloth will last longer and require very little care. However, players rated below A or even Open level may find it difficult to control their English. Leisure Cloth is a slightly thinner (20 ounce) version of our Premier cloth, bathed in a stain-resistant solution; 75% wool, 25% nylon. It is available in a very wide selection of colors. It is what most billiard dealers would include with their tables; either with or without the stain-resistant technology. 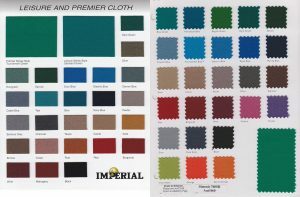 Eliminator Cloth is a 21 ounce worsted, low-knap wool cloth; bathed in a stain-resistant solution; 75% wool, 25% nylon. Backed cloth is available, but is normally purchased in full bolts by vending machine companies. It will last a long time, and is very resistant to tearing and miscues. However, it is absolutely terrible to play on. We can’t see why anyone would use it on a home or pool hall table. Thinner cloth (down to 16 ounce) is also available and should be cheaper than these others. However, we purchase almost $20,000 in good cloth, and no cheap cloth. As a result, it would cost us almost as much to order a few yards of cheap cloth as we currently pay for the good stuff we stock. There is no purpose to our even offering it. Plus, if you are paying $1000 or more for a slate pool table, it doesn’t make a lot of sense to save $50 on something so important.